Trade up your existing WatchGuard Firewall for a brand new Firebox M5600 with 3-yr Security Suite including WebBlocker, Application Control, spamBlocker, Gateway AntiVirus, IPS and Reputation Enabled Defence. Trade up your existing WatchGuard Firewall for a brand new Firebox M5600 with 3-yr Total Security Suite including WebBlocker, Application Control, spamBlocker, Gateway AntiVirus, IPS, Reputation Enabled Defence, Network Discovery, Data Loss Prevention (DLP), Dimension Command, APT Blocker, DNSWatch, Threat Detection and Response, and Gold Support. Trade up your existing WatchGuard Firewall for a brand new Firebox M5600 with 1-yr Security Suite including WebBlocker, Application Control, spamBlocker, Gateway AntiVirus, IPS and Reputation Enabled Defence. 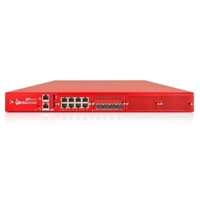 Trade up your existing WatchGuard Firewall for a brand new Firebox M5600 with 1-yr Total Security Suite including WebBlocker, Application Control, spamBlocker, Gateway AntiVirus, IPS, Reputation Enabled Defence, Network Discovery, Data Loss Prevention (DLP), Dimension Command, APT Blocker, DNSWatch, Threat Detection and Response, and Gold Support.